Korbin Pate never could have imagined it would all happen this quickly. Working in a control room that, just a handful of months ago, was an empty space inside the university’s William R. Johnson Coliseum, Pate was directing a nationally televised broadcast. “It was everything we envisioned and more when we went into this agreement,” says Pate, who has served as the athletic department’s video coordinator since graduating from the university in 2012. 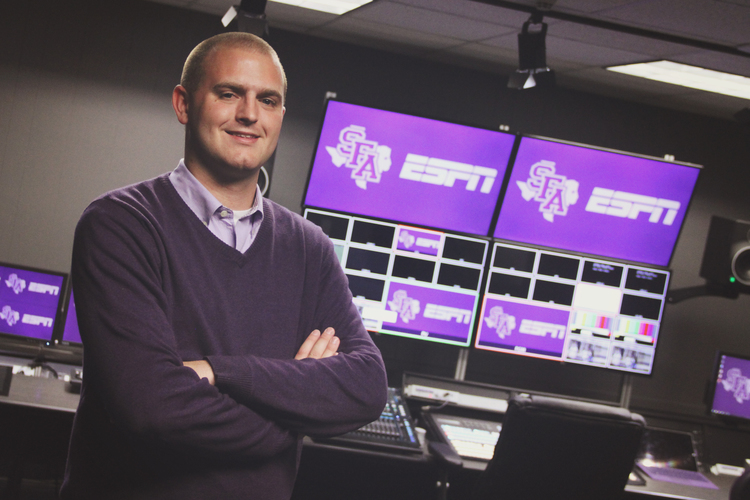 With the basketball regular season wrapped up, SFA can put an exclamation point on the first year of a media agreement with ESPN3 that saw the Lumberjacks produce more than three dozen events (football, soccer, volleyball, and basketball) live to the digital platform. A Lumberjacks win in last year’s NCAA Men’s Basketball Tournament served as a bit of a spark for the project, and, following a presentation to Director of Athletics Robert Hill and the administration, Pate received a budget of up to $500,000 to take a room at the basketball arena and turn it into a centralized control room. Working with designer and project overseer, Idibri, Pate and the athletic department designed a control room and connected 24 strands of fiber to soccer, volleyball, basketball, and football venues. 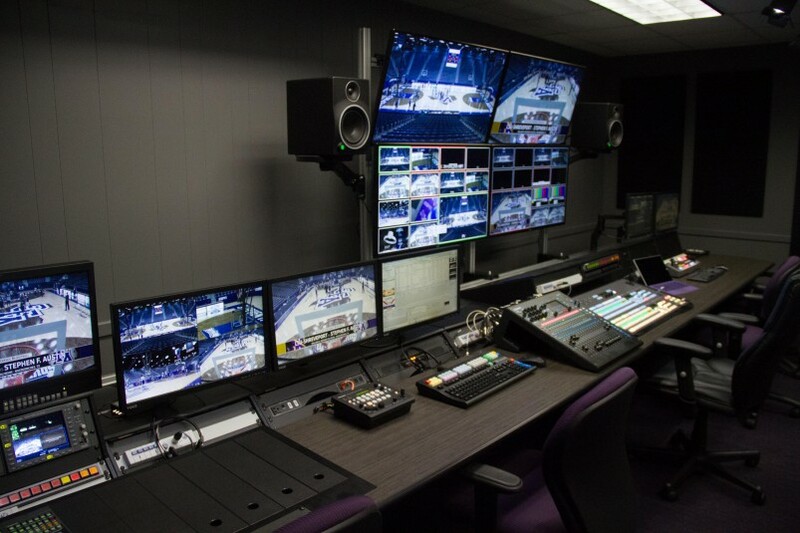 SFA’s control room connects to four venues on campus and is designed off the ESPN3 production model. Following the ESPN3 model that has become popular across college sports video, SFA invested in a Ross Carbonite production switcher (24 inputs, 2 M/E), an Abekas replay server, Ross Xpression for graphics, the Ross NK Series routing system, Blackmagic HyperDeck Studio, and a collection of Hitachi Z-HD6000 cameras. SFA became the first member of the Southland Conference to offer a full slate of games that met the ESPN3 standards and was just the fourth Football Championship Subdivision (FCS) school to produce a football event live on ESPN3. That first football event was less than memorable for Pate, however. The initiative fully lifted off the ground this past fall, and he describes his team’s first live production in one word: nightmare. But the Lumberjacks video team, composed largely of students from the university’s Communications Studies department, kept plugging away, and, in short order, the production quality grew rapidly. As for the appearance on ESPNU? Not wanting to bite off more than it could chew in Year 1, the Lumberjacks will not produce any events live this spring season. There is no fiber to the baseball and softball venues, and Pate knows that those productions require much more effort and resources to meet broadcast-quality standards. Now the “offseason” is a time to prepare and get better for 2016-17, with hopes of expanding the programming schedule.